Punks broke in and damaged the buzzer in the process, It now goes off even in the closed position. I suspect it is the switch itself as opposed to the buzzer. Bus will start and drive (at least 4 feet down my driveway). My guess there is no interlocks, has anybody just removed the whole assembly. If so any issues just capping the wires for now until I can remove some wiring? If that's the E-door buzzer, yes, I cut it out of mine. Just cap off the ends - DO NOT connect them to each other. To lock that door from the inside, I drilled a hole through the handle and the guard and use a cheap carabiner through the hole. Yes, I did something similar. On the handicapped access door, I removed the automatic light switch and replaced it with a toggle. 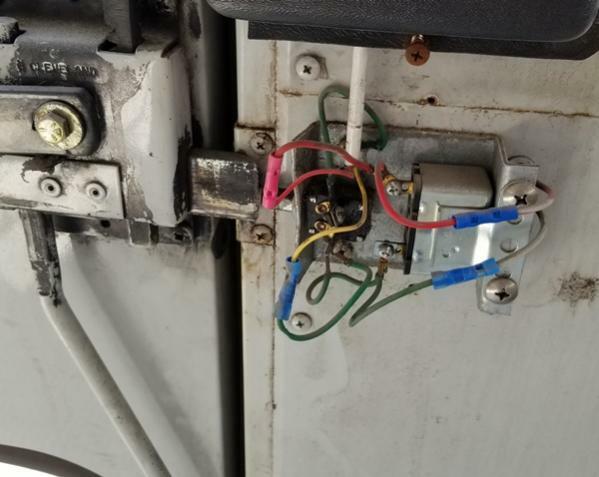 The buzzer was already disconnected when I got it, but the wiring bundle was still there over the drivers seat, along with other nonfunctional switches. I've removed the stop arm and disconnected all the flashers, capping off the wires that are now being removed. On the rear door, I previously removed the buzzer and taped the wires. As to the latches on both doors, I did something a little different: I drilled a hole through the tongues of the latches and inserted metal pins. That way, if you try the handle, it won't move.